The 17th century planter's church ruin at Cloncha is believed to have been built on the foundation of an earlier church associated with a monastic site founded by St Morialagh in the 6th Century. 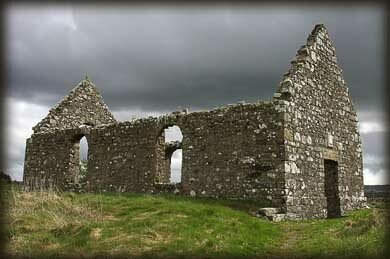 The monastery was one of the most important foundations in the development of Christianity on Inishowen. It's proximity to Carrowmore and another monastic site founded by St Boudan in Culdaff made this area a great seat of skill and learning. Only two high crosses remain - an upright tall cross with one reconstructed cross arm, and the head of another cross. The 10/11th Century tall cross, known as St Boden's Cross, is 3.95 metres high with carving divided into panels. The west face shown left, has two celtic interlace designs with the hermits St Peter and St Paul between them, immediately above the saints are two lions. The east face also features celtic interlace panel and the only sculptural panel has been identified as the miracle of the loaves and fishes. In the same field west of the High Cross, is the head of a 12th century wheel cross lying prostrate with a large base next to it. At the entrance to the site is a large wall and on the north side I found a bullaun stone, see photo. This was a nice surprise as I did not know of it's existence. The lintel above the west door of the church carved with ecclesiastics is significantly older than the current church. One can only imagine how beautiful this weathered lintel once may have been. Standing inside the church are two carved grave slabs. Although the stone on the left, see bottom image, is quite modern in comparison to the early grave slab, it is never the less, a very interesting slab. An inscription in Lombardic lettering reads " magnvsma corristin iaeotkiseo" translated as MAGNUS MACORRISTIN OF THE ISLES... MacGorristan is believed to have been a scotsman and there are several stories as to how this grave slab ended up at Clonca in Donegal. Built into the bottom right corner of the west face of the church is another inscribed stone, pictured above. The inscription reads " --]ANODUBDAGANDORI[-- | --]OGSODODOMNALLOR[-- | --]SUNN[--" o Dubdagain who made this stone for Domnall. Situated: Quite easy this one. From Carndonagh take the R244 east for 5 kilometres to Gorey. In Gorey turn left at the crossroads. The site is situated in a field immediately after the next crossroads. Park at the cottage and walk up the track next to it. Discovery Map 3: C 5253 4708. Last visit April 2010.